Ahh...don't you just love the details engineers put into things you thought were plain simple. The Ketupat - type of rice dumpling or rice cake - is one of the popular Malay delicacies that have been listed as heritage food in Malaysia. 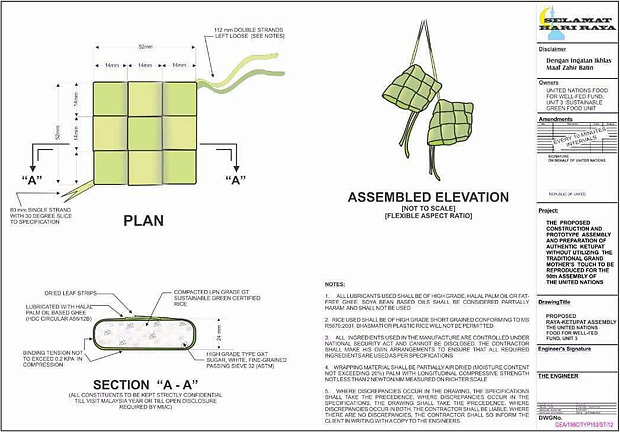 The Ketupat, when translated in English, is literally a made from glutinous rice. It’s usually wrapped in a triangular shape using the leaves of the fan palm Licuala. Wrapped in a pouch of woven palm leaves, is then boiled for hours. As the rice cooks, the grains expand to fill the pouch and the rice becomes compressed into soft cakes. In Malaysia, Ketupat is also traditionally served by Malays at open houses on festive occasions such as Idul Fitri (Hari Raya Aidilfitri). The copyright owner of the image may come forward to identify that this image is theirs and that in no circumstances should be publish unless otherwise stated, to which the administrator shall be obliged to remove such image from the website.